In today's Hit and Run, Jay Jaffe examines the impact of Randal Grichuk's injury on the Cardinals and recaps Eduardo Nunez's painful night in the Bronx for the Twins. Prior to this season, Randal Grichuk was best known as the player the Angels drafted in 2009, one pick before they chose Mike Trout. But after getting a taste of the majors last year, the 24-year-old rookie has emerged as a vital cog in the lineup of the team with the best record in baseball. Alas, the Cardinals will be without him for the foreseeable future, as Grichuk went on the disabled list on Monday due to a right elbow injury. Traded to the Cardinals in the same November 2013 deal that brought Peter Bourjos to St. Louis and sent David Freese to Anaheim, Grichuk began the season vying with Bourjos and Jon Jay for playing time in centerfield as well as backing up corner outfielders Matt Holliday and Jason Heyward. Though he homered off the Reds' Jason Marquis in his first plate appearance of the season on April 10, he made just 10 plate appearances before suffering a lower back strain that shelved him for four weeks. He quickly rejoined the outfield mix; when Holliday went down with a quad strain in early June, he became the everyday leftfielder, then shifted over to regular centerfield duty upon the 35-year-old slugger's return and the absence of Jay, who was sidelined by a left wrist injury. Overall, Grichuk has hit .284/.333/.561 with 15 homers. His slugging percentage and 141 OPS+ are both team highs and would rank among the NL's top 10 if he had enough plate appearances to qualify, but his total of 312 is 54 short. Via Defensive Runs Saved, he's been six runs above average in the field en route to 3.2 WAR, tied with Matt Carpenter for the second-highest total on the team. If there's a knock against him, it's that his 97/19 strikeout-to-walk ratio points to holes in his swing that can be exploited, but so far, pitchers have yet to catch up to him. Eight of his homers have come over the last 25 games, a span during which he's hit .302/.362/.625. Instead, it's the injury bug slowing him down. Grichuk began experiencing tightness in his elbow on Saturday, becoming increasingly uncomfortable after trying to throw the Marlins' Dee Gordon out at the plate. An MRI taken on Monday revealed that he has suffered both a muscle strain and a ligament sprain. He won't be eligible to return to action until Sept. 1, though with rosters expanding, he could do so as a pinch-hitter before he's ready to take the field—if his elbow allows it, obviously. With Holliday out until mid-September, Jay yet to swing a bat due to discomfort in his wrist and Grichuk now sidelined, manager Mike Matheny has to scramble to fill out his lineup, and to make matters worse, Heyward left Monday's game due to tightness in his left hamstring, though he's likely just day-to-day as opposed to needing a DL stint. That leaves the light-hitting Bourjos (.216/.315/.333), 27-year-old rookie Tommy Pham (8-for-47 after hitting .327/.398/.503 in 196 PA at Triple A Memphis), 24-year-old rookie Stephen Piscotty (.341/.374/.506 in 91 PA after hitting .272/.366/.475 in 372 PA at Memphis) and recent acquisition Brandon Moss (.212/.286/.386 in 375 PA for Cleveland and St. Louis) as the team's top options until Heyward returns. Moss, the lone lefty of the bunch, was intended to be part of a first base platoon with the unproductive Mark Reynolds (.228/.305/.393). Matt Adams, the team's regular first baseman, was felled by a quad strain that required surgery in late May; he is rehabbing at the team's spring training facility in Florida, but it remains to be seen whether he can progress quickly enough to go on a rehab assignment before the minor-league season ends. Given their six-game lead in the NL Central and the expectation that Grichuk and Holliday, who's slated to begin running this week, will both be able to return at some point in September, this is a short-term problem for the Cardinals, but it bears watching. Even assuming Heyward (113 OPS+) is back soon, the current missing parts mean that the only other above-average regulars in the lineup are Carpenter (131) and Jhonny Peralta (113). For as strong as the team is, they can't afford too many bad breaks in the injury department. Monday's Yankees-Twins contest in the Bronx was an ugly slog that featured 13 pitchers, 26 hits, five home runs, three instant replay reviews, two Yankees departing with injuries and two inexplicable lapses by the Twins. It took 10 innings spread over four hours and 13 minutes, and ended in favor of the Yankees, 8–7. At the center of the action was former Yankees infielder Eduardo Nunez, who spent parts of the 2010–13 seasons in pinstripes; he looked to be Derek Jeter's heir apparent at shortstop until his seemingly limitless lapses afield, at the plate and on the bases wore out his welcome. His penchant for errors, particularly throwing ones, earned him the nickname Nuneeeee. 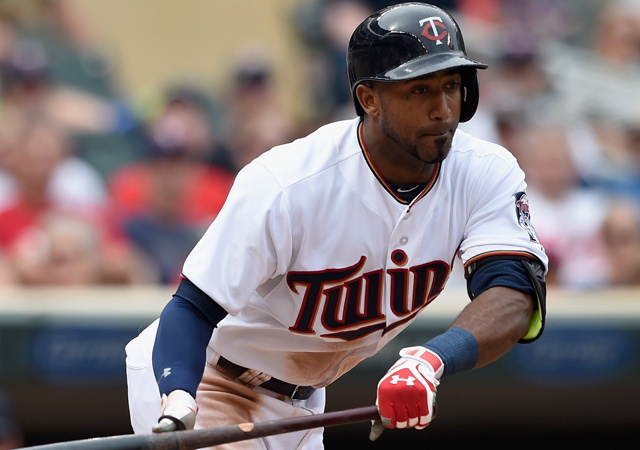 Traded to the Twins in April 2014, Nunez has continued to bounce around the diamond; this year, he’s spotted at four different positions for the Twins, and on Monday, he was the starting shortstop. With the Yankees having taken a 3–0 lead on Brian McCann's three-run homer in the bottom of the first, the Twins put two on in the top of the second against spot starter Bryan Mitchell, whom Joe Girardi called upon to give the rest of his rotation an extra day of rest. Nunez lined an 0–2 fastball back through the box that hit Mitchell on the right side of his face, dropping him to the ground, drawing blood and silencing the Yankee Stadium crowd of 38,943 as Eddie Rosario scored the Twins’ first run. Within a minute, Mitchell walked off the field with the help of the Yankees' training staff. He was comparatively lucky under the circumstances, as he was diagnosed with a small nasal fracture and will be monitored for possible concussion symptoms. Things could have been much, much worse. After a delay to bring in reliever Caleb Cotham, Nunez stole second base but was stranded there when Aaron Hicks struck out. "It's all my fault," Nunez said. "The pitcher did a good job. I have to do my job. I didn't complete the play. It's all on my back, this game. I think I lost the game. Yes, absolutely." Perkins thought the Twins could have turned two on the Headley grounder, which would have left him needing to retire Didi Gregorius to escape the jam. Nunez said the ball took a bad hop. "That's no excuse anyway," he said. "I have to make the play. I just reacted and threw it to first base." Ouch. The loss dropped the Twins to 59–59, 2 1/2 games back in the AL wild card, with both the Angels (61–57) and Rangers (60–57) ahead of them in the pecking order. The win lengthened the AL East lead of the Yankees (65–52) to a full game over the idle Blue Jays (65–54).